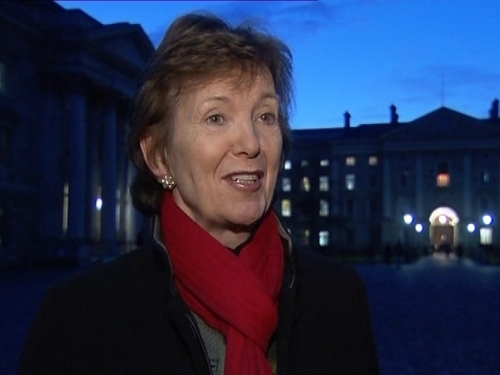 Former President Mary Robinson has said she will voluntarily take a further 10% in her State pension, bringing the total reduction this year to 20%. The move comes as a report commissioned by the Government said the link between public service salaries and pensions of retired public servants should be reconsidered. The pensions of retired public servants were not cut in the Budget but the Government is reviewing the situation. Mary Robinson said today it was important that there was a sense of fairness and those of us who can pay more, be taxed more and contribute more, must do so and be seen to do so. The Review Body of the Higher Remuneration report says top level public servants should not receive any pay increases including by way of wage agreements until 2012 at the earliest. The report also found that the salaries of the Taoiseach, Government ministers and top civil servants were substantially higher than those found in a range of six EU countries. The gap was less pronounced when the value of benefits and income tax were taken into account but salaries were still higher. The report's findings do not take into account the decreases announced in the Budget. The review body also said that Government should reconsider the link between salaries of serving public servants and pensions of those retired. The pensions of retired public servants were not affected in the Budget but the Minister for Finance said they would be reviewed. The findings of this report were announced by the Minister for Finance in the Budget, with cuts of 8-15% on the cards for 1,600 top earners in the public service such as university heads, secretary generals of Government departments, county managers and also ministers. The Taoiseach’s salary is to be permanently reduced by 20%. The report published today states that levels were compared against those in Austria, Netherlands, Belgium and Finland, Britain and Germany. When adjustments such as benefits and income tax are taken into account, the Taoiseach's salary was found to be third highest, behind Britain and Germany. With adjustments taken into account, ministers are also third best paid, again behind Britain and Germany. Heads of departments are second highest paid, behind Britain but ahead of Germany. The findings do not take account of Budget deductions. Unlike previous reports, the salaries of senior public service were benchmarked against other countries, not, as the report said, 'the excesses of certain cases in the private sector'.